This post is sponsored by Bob’s Red Mill. They make a huge range of quality products including the Hulled Hemp Seeds I used for this post. Check them out on Facebook and follow them on Twitter for lots of fun recipe ideas. For a limited time, you can snag a $1 off coupon for their products! I feel like there are so many interesting grains and seeds to try these days. It can be a bit intimidating to know which to use and if they are any good or just hype. 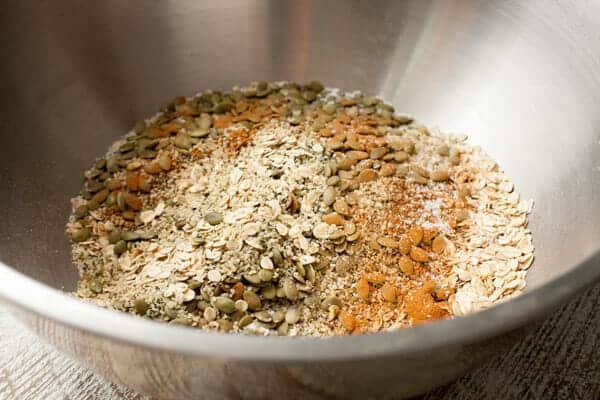 I’ve had hemp seeds on my list to try for a very long time now and this Hemp Seed Pumpkin Granola was my biggest success with them. For starters, because somebody will email about this, hemp seeds DO NOT contain THC. You will not get the slightest bit buzzed from eating them. No worries there. But they are filled with protein and fiber though so I really like starting the day with them, which is why this granola is so perfect. Generally though, hemp seeds can be used as a topper for many dishes. Toss a spoonful on cereal and yogurt or blend some up with your smoothie. Or just make this granola because it’s really good. Crunchy granola with loads of fiber. I like to add just a touch of sweetness with real honey and dried blueberries. 1) Preheat oven to 325 degrees F. Stir together oats, hemp seeds, pumpkin seeds, spices, salt, oil, and honey in a large bowl. Really take your time stirring everything together to make sure everything is well combined. 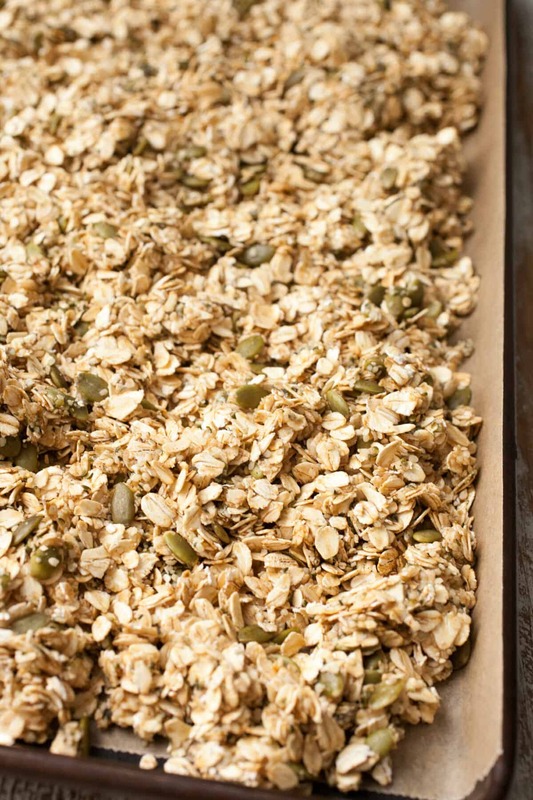 2) Spread the granola out evenly on a baking sheet lined with parchment paper. Bake for 25-30 minutes, stirring the granola 2-3 times while it bakes. If the granola is getting too browned on the edges, turn your oven down 25 degrees. 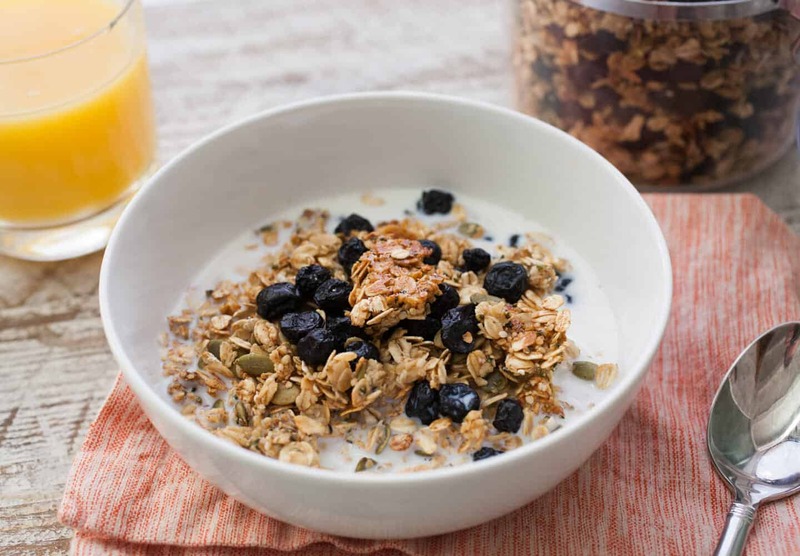 3) When granola is browned and cooked, remove from oven and toss in dried blueberries. Stir well to combine. 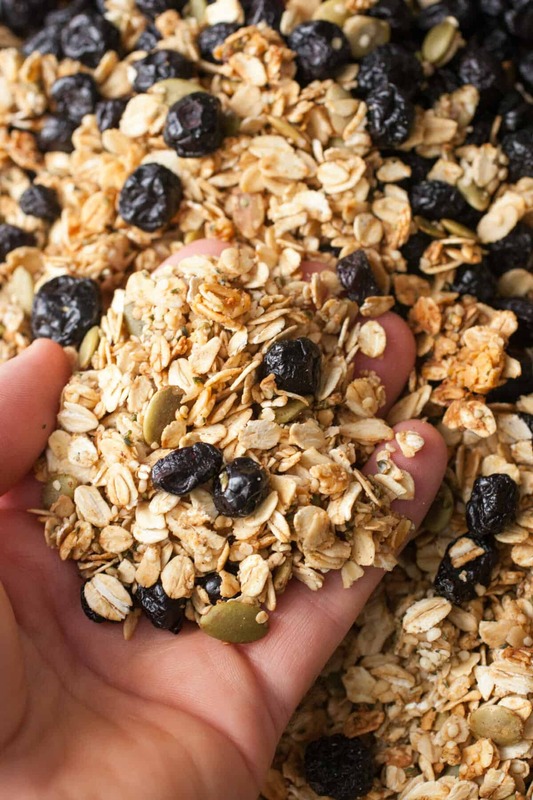 Let granola cool before storing in an airtight container. 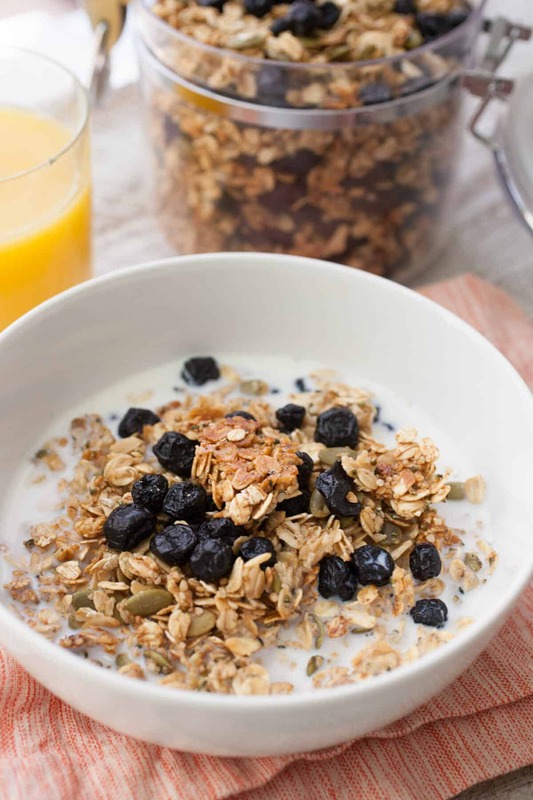 Granola is great with milk or yogurt! It keeps fine at room temperature for a few weeks. 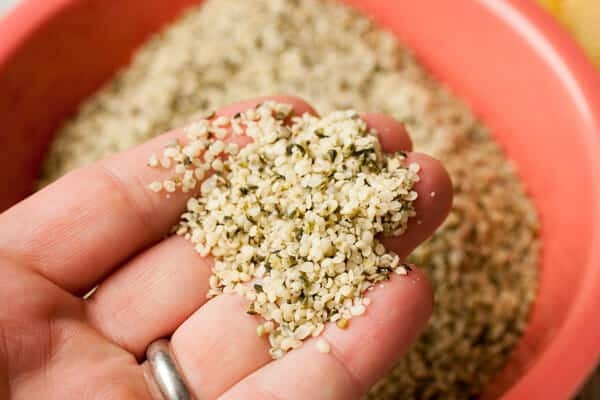 Hulled high quality hemp seeds are a bit on the pricy side, but a little goes a long way. I used a full cup of them in this granola recipe but you could cut it back to half a cut to get more bang for your buck with no other changes to the recipe. The tiny seeds have a really soft texture and a subtle nutty flavor. Mixing the granola together is pretty straightforward. I recommend mixing the dry stuff up first so it gets well combined. 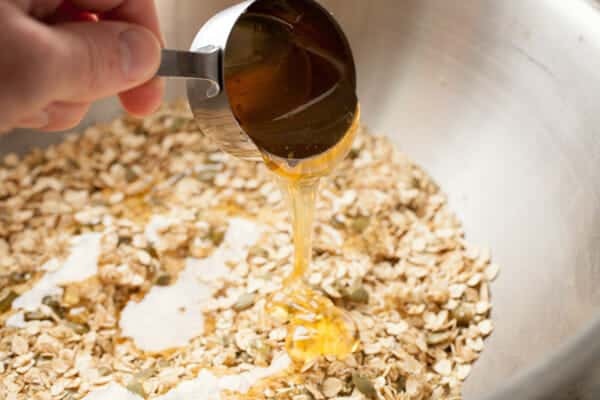 Then you can stir in the oil (which gives the granola some nice crunch after it bakes) and the honey. No other sugar or sweetener is needed in this recipe. Mix together the granola really well and spread it out on a baking sheet lined with parchment paper. Try to get it in a nice even layer. Take the granola for about 25-30 minutes and stir it a few times as it bakes. If the edges of the granola get too browned, you can turn your oven down 25 degrees (some ovens run a little hot). When the granola comes out of the oven, toss on the blueberries and mix everything together. Once the granola is cooled, it’ll keep in an airtight container at room temperature for a few weeks. It’s perfect with milk or yogurt. Your call. This hemp seed pumpkin granola has great fall flavors and is an awesome way to start the day. Try it this week! 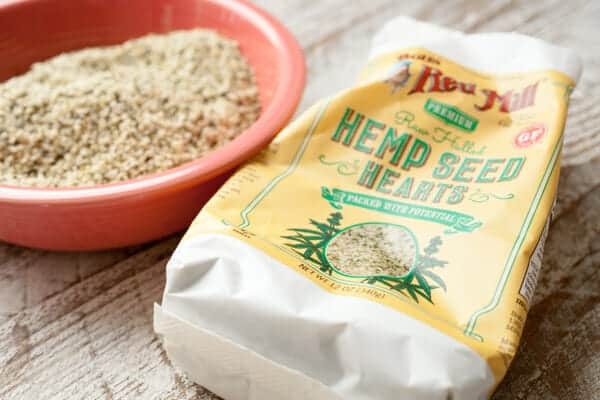 Never tried hemp seed, looks promising. Love the inclusion of dried blueberries, I love how they turn your milk blue and add a great flavour. Also love the inclusion of oil for a bit more crunch, never tried that before with granola. Can’t wait to try.